Funeral directors on Brighton Road. 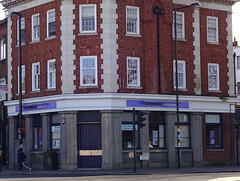 According to Google Street View, as of September 2012 it was a branch of Barclays bank. This had closed down by April 2015. A branch of Co-operative Funeralcare moved in some time between December 2015 and September 2016. Last edited 2017-10-05 16:49:49 (version 10; diff). List all versions. Page last edited 2017-10-05 16:49:49 (version 10).